Aren't these cute! I made these Paper Pumpkins from scrap craft paper I had. 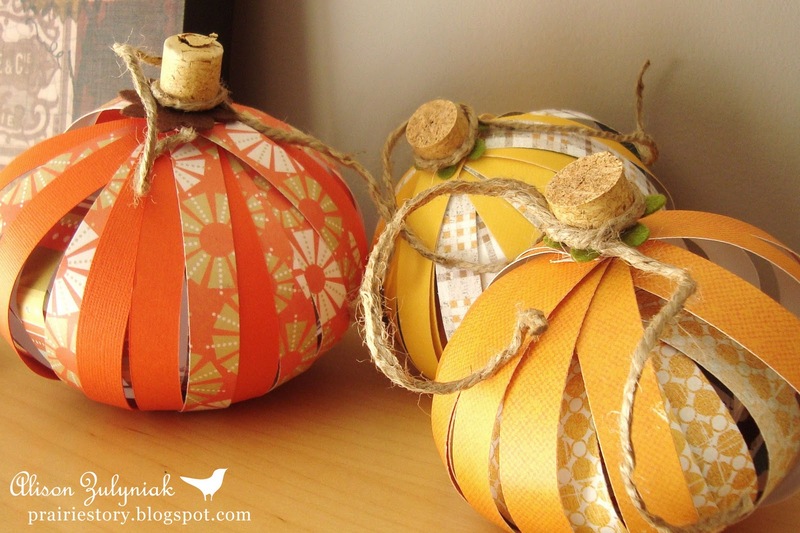 They were fun and easy and perfect for fall decorating. I first saw these at Holiday Haven. Rather than using paper for the stem, I actually used wine corks, some felt and twine. Visit Holiday Haven to see her version and the link to the full tutorial. Serious cuteness. Love the corks, what a fabulous idea! Great idea on the wine cork! Thanks for sharing ... I've posted a link. Good job - so cute! These are adorable! Thanks for linking up! These turned out so cute. Love the cork stems! Oh cute! I love how you can totally make them to match your decor. Thanks for the idea! How adorable, Alison! I am so glad you came to the Pumpkin Party - now I have a new Canadian friend! Blessings to you! The wine corks are genius!!! I would love it if you linked to my party! Love these. The cork stems are a nice touch.